Dr. Helms has been a practicing optometrist for two decades. 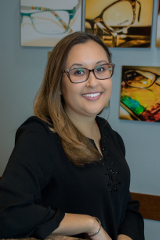 A graduate of Ferris State University’s College of Optometry she began her professional career at an Ann Arbor-based private practice. Sixteen years ago, Dr. Helms and her family relocated to the Grand Rapids area and has been practicing optometry in the Grand Rapids area for many years. She joined Detroit-based D.O.C., serving as the Doctor of Optometry for the Woodland Mall location. After thousands of patients and more than a decade practicing with D.O.C., changes at the corporate level inspired Dr. Helms to return to private practice, and Helms Optical began. 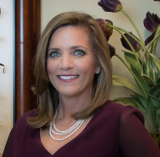 For Dr. Helms, the ideal is to be the kind of optometrist that she grew up with: family focused, friendly, and approachable. Technical excellence and expertise in addressing her patients’ visual needs is paramount, but Dr. Helms places great importance on building a relationship of warmth and trust. She relishes the time it takes to get know her patients as people. Dr. Helms’ husband is also an optometrist. They are the proud parents of two wonderful children. Gina has recently joined our staff although this is not the first time Gina and Dr. Helms have worked together. Gina was originally a patient of Dr. Helms’ over eleven years ago at D.O.C. Dr. Helms was so impressed with Gina when first introduced that Dr. Helms recruited Gina to come on as an optician for that company. Gina has therefore worked in the optical industry for over a decade. Gina is happily married to Dominic and has three wonderful children. 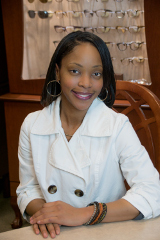 Shameka joined Helms Family Optical in 2015. She came to Helms Family Optical with over 15 years experience. She has also done medical assisting in the past, but optics is her passion. She has 3 amazing boys that keep her going when she is not in the office.